Merchandising is the visual theater of sales. These appealing and effective displays showcase our eco-friendly products, increase sales, and look fantastic in your shop. Jonsteen’s 12-Pack Displays are an ideal countertop showcase for any Grow Kit assortment you choose. 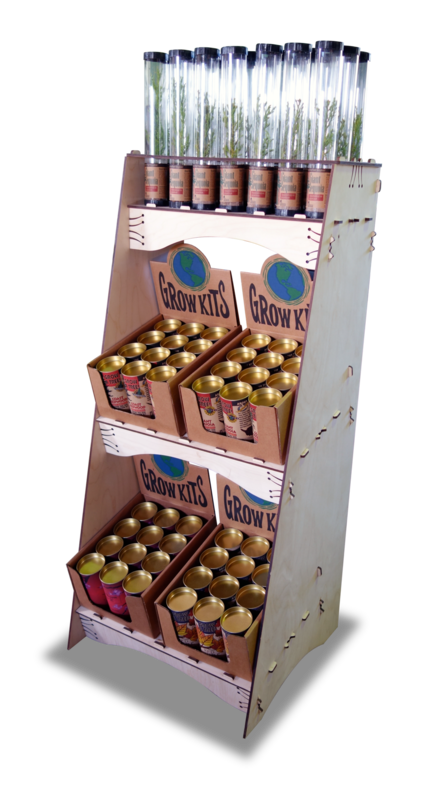 Made of sturdy, re-usable, recyclable cardboard with an eye catching header that immediately tells your customers what they are looking at: Grow Kits! Show off 18 wonderful trees with this durable and well-crafted wooden countertop display. This innovative and appealing display showcases a variety of Jonsteen Trees and Grow Kits without using too much of your precious counter space. Our Poppy Kits look great individually. Put 18 of them together in this custom wooden countertop display and the impact is amplified to great effect. Customers will flock like bees to flowers! Our 12-Piece Christmas Tree Display was created to compliment and enhance our popular Living Christmas Tree seedlings. Fun, colorful, and descriptive — bring the holidays to life with this festive countertop display! Our large wooden display is ideal for high traffic locations. It holds 21 trees and 48 Grow Kits for a total of 69 pieces. This is a beautiful and sturdy floor-standing fixture that fits together without any hardware and will not be missed by your customers!